We finally decided to go ahead and buy a set of Ruth Elsaesser nature postcards. 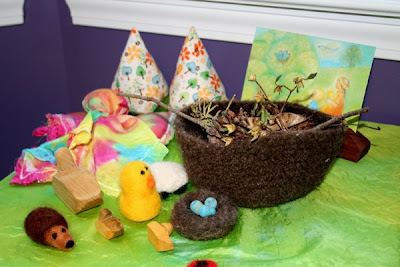 Our nature table desperately needed them. 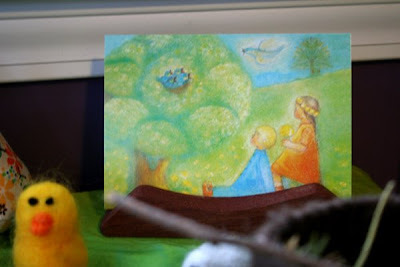 When I ordered Finn's rotating pictures from Waldorf Toys, I also ordered a few postcards. Have you seen their selection?! Oh man...it was hard not to buy them all, but I settled for a select few. I'm sure they'll be popping up here on the blog before too long. We also bought a small set of block crayons. The kids were a bit suspicious at first, but I told them to stick with one color and just make a design with the shading. A fun exercise...these crayons will grow on all of us. I'm sure of it! What a great project. Now its on my (very long) list of "to do." You are tempting me to order something! I have the same book Dawn has, and it's amazing what can be drawn with only the 3 primary colored block crayons. How wonderful! We started enjoying the block crayons this year, too. You'll have to check out Sigi de Francesca's DVD and book. They are amazing! Within minutes, you will be able to draw the most beautiful pictures with just the primary colors. yes, they will grow on you! it really helps to put a padding of some sort under your paper for a softer look. We made ours with brown butcher paper with a bit of newspaper inside- then taped up all the sides with masking tape. 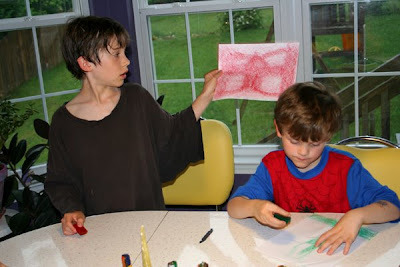 they were about twice as big as our drawing paper and worked excellent for catching crayon 'run-off' as well. 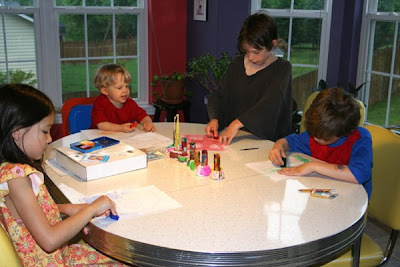 whenever they wanted to draw they'd first have to get their drawing pads- just like in kindy at waldorf. i have sieggi's dvd that is really great! i learn much better through live action rather than books. i've also taken one of her classes at the waldorf in the home conference. and even in the dvd she only uses 3 colors- it's really impressive!